Sahil Graphics has been the Indian pioneer in the exporters & suppliers of sophisticated poly offset printing machines and Polythene Offset Printing Machines with UV curing attachment to print Polythene Bags, Carry Bags, Poly Bags, Plastic Bags, & other PVC material built to offer high quality results with economy and reliability. In addition, we are the principal polythene printing machines manufacturer located in India. Sahil Graphics has been the Indian pioneer in the exporters & suppliers of sophisticated poly offset printing machines. SG has developed new generation 3-in-1 Poly Offset Printing Machines with UV curing attachment to print Polythene Bags, Non Woven Cloth as well as Paper built to offer high quality results with economy and reliability. In addition, we are the principal polythene printing machines exporters & suppliers located in India. Sahil Poly offset machine is compact & has an efficient design. Sahil polythene offset printing machines have been specially made for drying Poly/PVC surface to meet the requirement for quality short/long run jobs on plastic bags. Utilizing technology developed by Sahilâ��s own R & D department the machines have proved their worth not only in India but abroad as well. The 'Plug 'N' Print' capabilities of the poly offset machine are complemented by a countrywide support network and Sahilâ��s highly customer focused approach to marketing. UV curing system which we use is a photochemical process, when ink applied on the poly surface and it pass through under UV (Ultra Violet) light, it get cure instantly with highest efficiency and consistent quality. The polythene surface will be dried promptly, smooth, & beautiful. The use of UV technology offers many advantages for all print process. We provide on line curing system with all sizes of Sahil Offset Presses. Through the years, advancement in offset press technology has enabled printers to achieve higher levels of quality and visual impact. AccordingÂ toÂ theÂ demands & latest trend of the market,Â thisÂ Polythene printing offset machine is designed by Sahil Graphics, Faridabad, India to printÂ colorfulÂ small and medium jobs on plastic poly bags, Shopping bags, Carry bags as well as on papers. 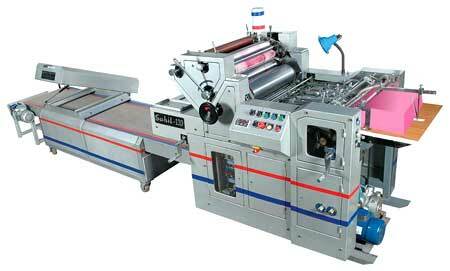 So, as to ensure Sahil Poly printing offset machine is competitive in price & welcomed by the Polythene bag printers. Polythene printing is an evolving process. Through the years, advances in press components have enabled printers to achieve higher levels of quality and visual impact. One of the most notable recent developments is the escalating use of UV inks. Offering significant advantages over water and solvent based inks, UV inks are experiencing explosive growth in the poly offset printing industry. As industry demands for visual impact increase, poly offset printers seek to add color density while preserving or even enhancing image quality. There in no component that evaporates so there is no need for clean-ups between press runs. UV inks are typically very thick. It is important to note that printers are experiencing good results with rolls manufactured to specifications established for water and solvent inks. EPDM /ANIROX rollers can be used for printing UV and provide a benchmark. Floor Space : Length x width x Height 4250x1168x1295mm & 167"x46"x51"